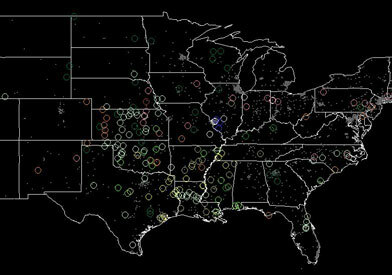 You may also be interested in the tornadohistoryproject.com for more information about Tornado history. 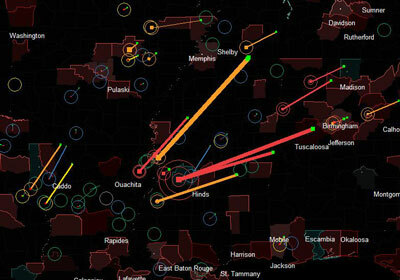 Twistery (Twister History) is a simple, free program to visualize the history of tornadoes in the United States. 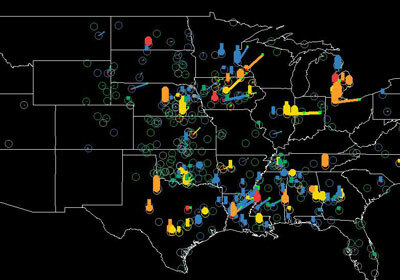 The program allows users to build their own maps of tornado activity in the continental United States. 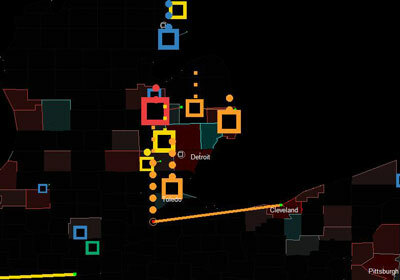 Users may visualize the data as static images or as animations. The visualizations may be customized by changing visualization calculation factors and colors of static and dynamic content. Static images may be exported to popular image file formats for comparative analysis. 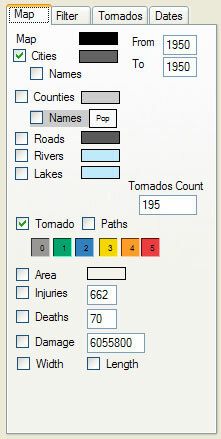 Individual tornado instances can be investigated by selecting a single tornado instance, or by selecting the tornado from the drop down list on the tornado's panel. This program was written in Visual Basic .Net. 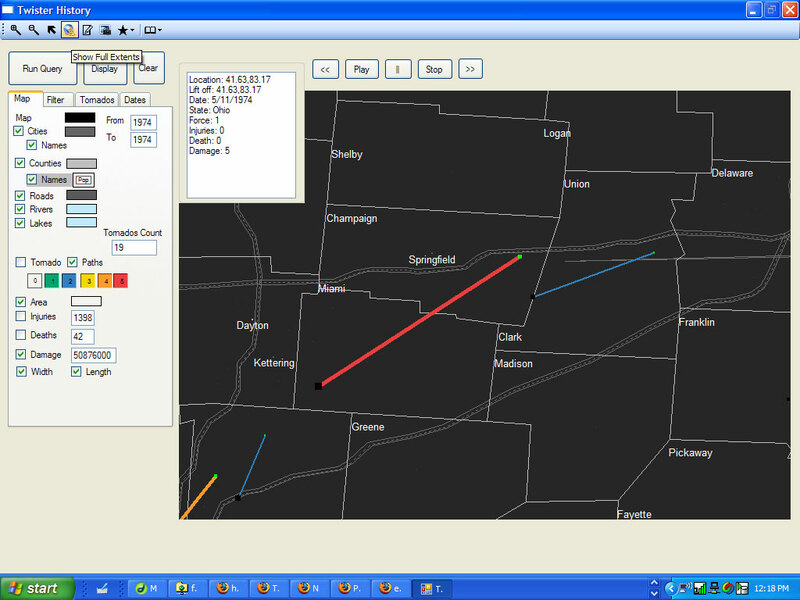 It is based on the Map Window OCX. 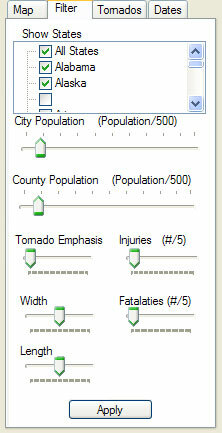 The code uses classes to store map preferences, user query preferences, and tornado instances. 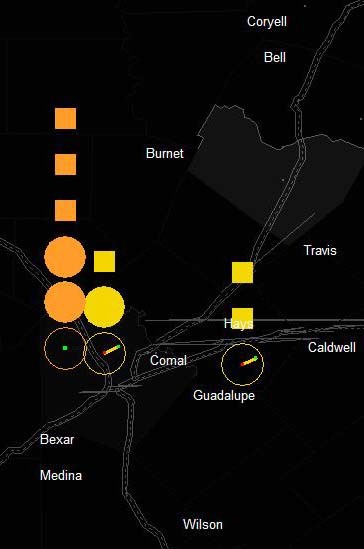 Geo-referenced data, such as county populations, are “normalized” by dividing the population by a user specified factor and distributing the value on the user selected color. 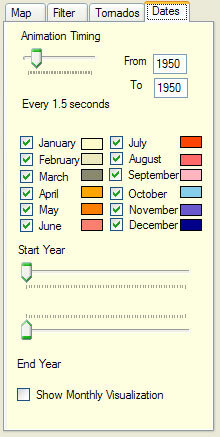 Other visualization elements are represented through simple calculations of size or color. Data is stored in an Access database and .Net datasets for fast execution. 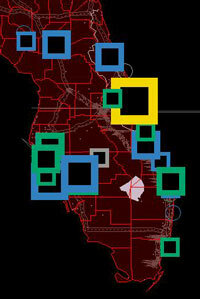 Data can be exported to shape files. Data can be imported from raw, comma delimited text files using the program's data import tool. 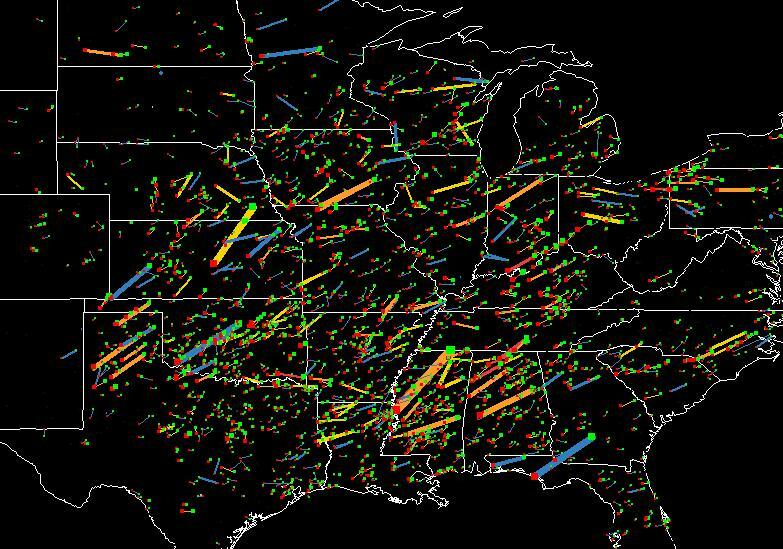 Data is stored in a single access table, that maintains the data type and structure of the NOAA tornado archive. Standard , dynamically written SQL statements handle the insertion and selection of records. Data is converted through a set of enumerations and lookup functions for human readability. The use of a database allows the program to include user specified queries and the the "top queries" provided in the user interface. 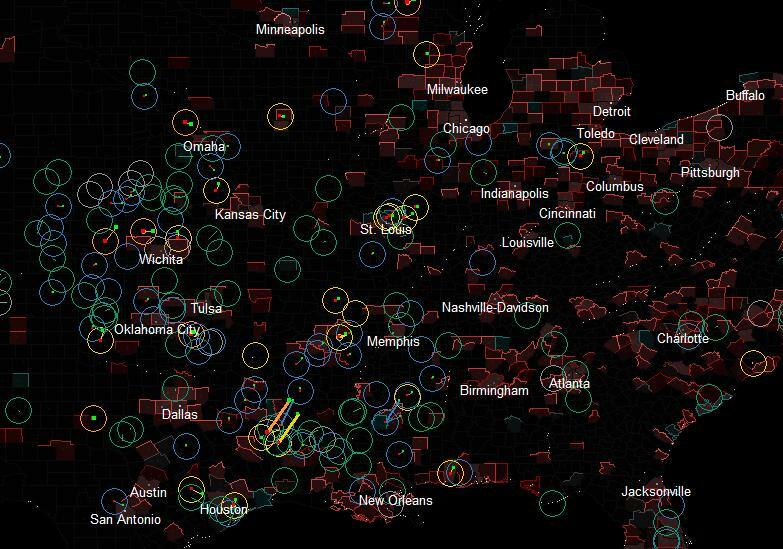 Maps are not cleared when retrieving new data so that users can review a comparison between visualizations. The color of items may be changed to enhance visualization. Please choose the color bar next to the legend item to change it's color. 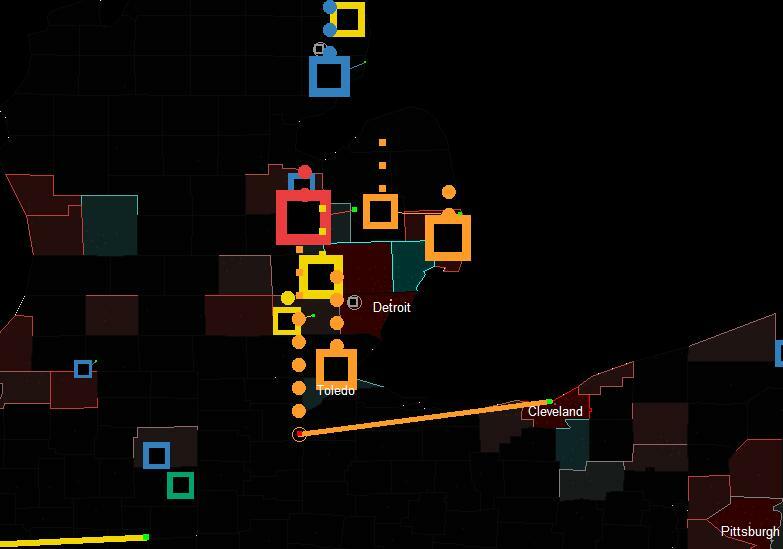 There are two modes to filter and refine the visualization. Query filters, which effects the source data used for the visualization, and Map filters, that effect the display properties of the map. 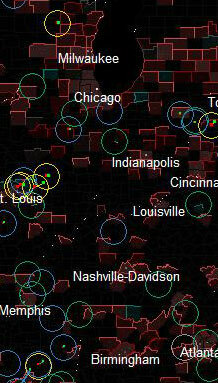 When changing map filters the user need only redisplay the map. When changing the query filters, the user must retrieve the new data. 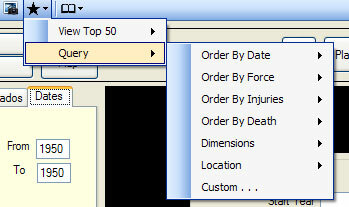 Users can specify select from a set of predefined queries for the top injuries, deaths, damage, et al. 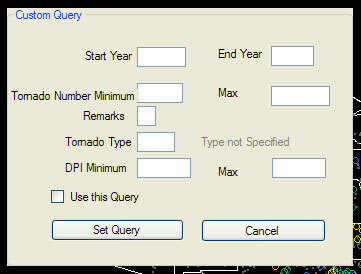 Uses can customize their queries by selecting the custom query from the queries drop down list. 1953 view of descruction caused by tornado events. 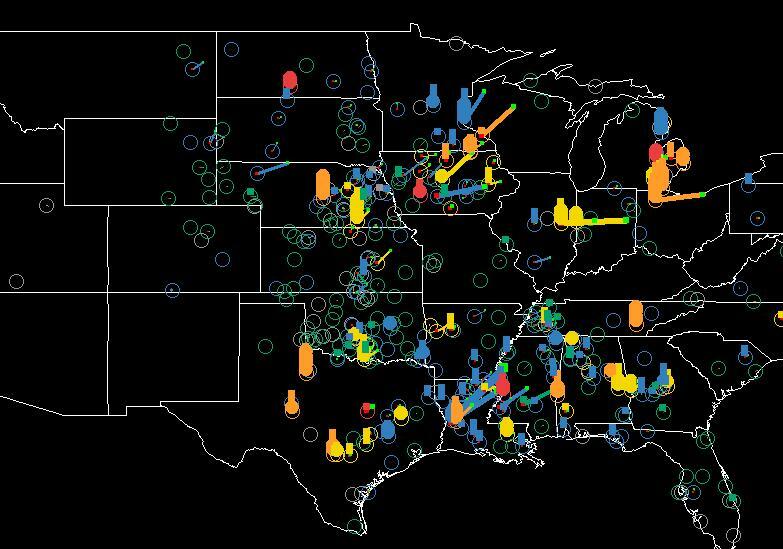 Midwest area tornado map indicating number of people wounded or killed by tornado. A map of some of the tornados with some of the longest paths from 1955-1995. Installation note: please install in the default director, c:\tornado to prevent problems. Thanks!